Is your Council on Twitter? Probably not yet, to be honest. But ten London boroughs have taken the plunge and are attempting to interact online with their residents, with varying degrees of success. Some of them are even occasionally interesting, or indeed useful. None of the ten are tweeting prolifically, so don't worry that your council tax is being wasted. Here's a quick summary of how they're doing. » Example: "Could Barnet be more creative in park flower design: Some time ago I made a photo survey of parks in Barnet, Bre.. http://tinyurl.com/dezm74"
» Example - "Visit The Brent Museum to find out about the Gayer Anderson Cat http://tinyurl.com/cf2yaa"
» Example - "Power cut in the Hampstead Road area, some residents are without electricity: http://bit.ly/qVSL #camdencouncil #eustonroad #camden"
» Example: "From News Feed: Extra refuse services available for Passover: Special skips will be appearing in .. http://tinyurl.com/d2na7v"
» Example: "Say hello to @CllrSSD - first Hillingdon councillor to use Twitter"
» Example: "New initiative launches in Lambeth to stop knives getting into hands of young people http://bitly.com/hKrIY"
» Example: "Dog micro-chipping today from 12noon-6pm http://tinyurl.com/c8z8om"
» Example: "Redbridge i, the council's innovative website wins a prestigious award http://tinyurl.com/d4faxc"
» Example: @loobs0 "We'd laid down 500 tonnes of grit between Sunday afternoon and yesterday afternoon. Had another 60 people out gritting last night..."
» Example: "Dry cleaners go green: Two-thirds of Wandsworth's dry cleaning operators attended a council training workshop on.. http://tinyurl.com/79vxkt..."
If you live elsewhere in the UK, or if you want to discover whether your local councillor is tweeting, check out the ever-growing directory at Cllr Tweeps. It's future of local democracy, you know (or perhaps a pointless micro-audience dead end). Last week the British Museum reopened a major refurbished gallery. Officially it's designated the Paul and Jane Ruddock Gallery of Medieval Europe AD 1050–1500, although it's snappier to call it Gallery 40. Top of the main stairs, straight across the landing, fork left. It's full of pre-renaissance artefacts from across the continent, including a beaker from Venice, a gold cup from Paris and tiles from Tring. There are quite a few monastic bits and pieces, including fine jewellery and intricately carved stonework. But the centrepiece of the room is a glass cabinet containing the famous Lewis chessmen. 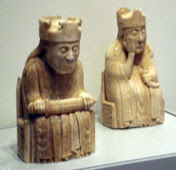 The chess pieces are of Norwegian origin, probably 12th century, and are carved from chunks of walrus tusk. The major pieces have beautifully carved faces, almost cartoonish to modern eyes, including a gruff beardy king and a rather huffish queen. There are more than enough pieces for a complete set, so some are displayed on a red and white board and the rest are laid out around the display case either singly or in groups. They make a most impressive strategic army, and are a reminder of the excellence of European craftsmanship almost a millennium ago. 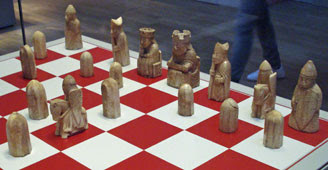 As for the Lewis connection, the 93 chessmen were supposedly discovered inside a sand dune on the beach at Uig sometime around 1831. Nobody's quite sure precisely where, nor how they came to be in this remote Hebridean location, nor indeed whether any Viking overlords ever played chess with them. Why, indeed, is there only one proper rook in the collection, and why were half of the pieces stained red rather than the more usual black? Whatever the uncertainties about their purpose, nobody doubts their authenticity. It wasn't long before Victorian custodians split the collection. 82 of the Lewis chessmen are now in the possession of the British Museum, while the remaining 11 are held by the National Museum of Scotland in Edinburgh. Not surprisingly there is much debate about where they should best be displayed. As a British find they have every right to be in the British Museum, argue some, even though that's 500 miles from the point of discovery. As a Scottish find they should all be in Edinburgh, argue others, so send them back immediately. Some on the island of Lewis believe they should return home to the Hebrides instead, probably to the Museum nan Eilean in Stornoway, even though far fewer people would be able to see them there. As for the people of Uig, they've only been allowed to see six of the pieces for a single day at the local community centre back at the turn of the century. Uig's such a remote spot that I didn't even get that far when I was exploring the island of Lewis three years ago. I regret not stopping by to see the glorious beach, plus the ten-foot-high replica chessman planted in the dunes to remind visitors of the area's great discovery. I got within ten miles, but the relentless drizzle and intervening single-track road diverted my exploration elsewhere instead. Thanks to the British Museum's persistent possessiveness I can pop in and view the Uig ivory hoard in central Bloomsbury, a few miles from home, whenever I feel the urge. A considerable souvenir industry seems to have built up around the chessmen, flogging replicas (and keyrings) to visiting international tourists, so the British Museum would probably lose income were they ever to return the pieces to those who might deserve them more. To be honest, given their origin, the 93 chessmen probably ought to be sent back to Norway for permanent display in the country that created them. For the foreseeable future, however, it's stalemate. Yesterday morning, in fact. In central London. Like you do when it's raining. I tried paying with a £20 note and the bloke behind the till had the cheek to ask if I had anything smaller. I was very tempted to say "well if you charged a sensible amount to sit in a dark room and watch flashing images, like under a tenner, you wouldn't be having this change problem would you?" And "I'm the fourth person through the door, how can you have run out of five pound notes already?" But I had nothing smaller, so I ended up with a pocket full of pound coins. The bloke behind the till asked me where I wanted to sit, front or back? So I asked for middle. Then he printed my ticket. Seat J12. I didn't actually sit in seat J12. It was a ridiculously empty auditorium, and I'm not having some till-monkey tell me which of the 300 empty seats I have to sit in. So I sat in seat J11 instead. Rebel. I was very pleased with my seat. Slap bang in the middle of the cinema with absolutely nobody in front of me. Everybody else had chosen the back row, and then there was me all alone in the centre. Fab. Draw back those curtains and let's roll. But it never lasts, does it, cinema seating perfection? Just before the adverts started another couple walked in. They looked around briefly, checked their ticket and then sat down in the two seats directly in front of me. Him in seat H11 and her in seat H12. 298 empty seats to choose from, and they plonked down directly in front of the only other person sat in the middle of the cinema. And why had they blocked my view? Because the idiot on the till had placed them there. There was absolutely no chance of the auditorium getting even 10% full, no chance whatsoever, and yet he still insisted on issuing seats from a tiny block in the middle of the cinema. Bloody Odeons, eh? Attempting to maximise profit at the expense of customer comfort, even when the place is nigh empty. I considered storming out in protest, but instead I just moved along the row to J8. I watched the trailers for forthcoming films, and they all looked rubbish. Why do film trailers now insist on telling you in which year the film will be released? They always kick off with a big bold American voice announcing something like "This year... romance becomes an adventure" or "In two thousand nine, death will stalk Manhattan". There's never a proper hint as to precisely when this year the film will be released. Will it be next week, or do we have to wait until Christmas? Why can't film companies actually give us a date, or at least an intended month, rather than forcing everybody worldwide to watch the same generic ambiguous teaser? They've spent millions on the film - why can't they spend a tiny bit more on the trailer? As the film started, I got a packet of Minstrels out of my pocket. Don't worry, I didn't buy the Minstrels in the foyer. I bought them in a real shop down the road where a small packet cost sensible money. And don't worry, I ate them really quietly too. Unlike the couple in the row in front who rustled their enormous crinkly packets at every opportunity. Apart from the enormous plot holes, that is. And the insane premise. And the stilted dialogue. And the sudden change of direction two-thirds of the way through. And the two white rabbits. And the lunatic off-the-wall ending. I shall try not to go back. There were once a lot of rather special places within the boundaries of the Olympic Park. Reedy pools, leafy retreats, waterside towpaths, hidden gardens, secret backwaters... all scattered across a harsh unforgiving industrial landscape. And now there's a building site in their place. Something world-class is emerging, and a biodiverse legacy should ultimately be delivered, but I still miss the opportunity to visit a favourite local environment with a genuine natural spark. At the tip of Blaker Road, immediately before the elevated sewerpipe, lurked one of my favourite secret places before the Olympics came along. Up the short staircase to the left, then down to a small secluded concrete ledge on the banks of the City Mill River. You couldn't block out the traffic noise from Stratford High Street, but in midsummer you could crouch down unseen and watch the dragonflies skimming and skating across the surface of the weed-topped water. Today, although not quite within the perimeter of the 2012 security zone, the path to that hovering hideaway is blocked by an unsightly hillock of abandoned tyres. Through the dank tunnel from my last location, walkers emerged into an artificial hollow sandwiched between a sewer and a railway. Here a silent triangular pool poked out from the neighbouring river, filled with reeds and tall grasses and nesting waterfowl. Unkempt trees and bushes draped over the footpath, bursting into bloom each year with understated grace. It was however important to look down, not up, otherwise you'd see the legs of a giant pylon atop the adjacent slope, and catch sight of passengers in passing trains wondering what the hell you were doing down there. Today those grassy slopes have been flattened and every scrap of vegetation cleared, while the pylon has been dismantled and its electricity channeled underground. On a thin ridge beside the River Lea, accessible only across an often-locked footbridge, lay the vegetable gardens of Hackney Wick. These treasured allotments were a fertile strip of urban cultivation where local residents grew runner beans and cabbages and prize-winning roses. Most plots boasted a tumbledown shed or a splintered lean-to, perhaps with a rusty watering can for good measure beside a row of sprouting brassicas. This horticultural hideaway supported a thriving community of seasonal diggers for over a century, until the Olympic diggers arrived to claim the vegetable patch as their own. Today the allotments are nothing but flattened soil, devoid of any plantlife whatsoever, while the former residents attempt to make a new start on a sodden ill-drained replacement site upriver. For a few weeks before the Olympic Park was sealed off, an unlocked gate allowed temporary access to a lost mile of forgotten meandering footpath. Two summers of vegetation had been allowed to run rampant, creating a just-accessible thicket of shoulder-high grasses and brambles along the waterside. A secret narrow urban jungle had been opened up, for the benefit of myself and any other inquisitive able-bodied explorer wearing sufficient protective clothing. Here dog roses and convolvulus grew unhindered, here magpies and moorhens ruled their roost, here ladybirds clustered on untrampled nettles. Today the riverbank has been cleared and carved and widened, and is once again inaccessible except to an army of construction workers. The tiny Channelsea River once flowed along a hard-to-find fringe of the Eastway cycle circuit. Its miniature valley was a leafy haven for a wide variety of wildlife, from butterflies and buzzing insects to the occasional reported kingfisher. Every summer the trees and bushes exploded in a riot of green, and only stray cyclists or in-the-know local residents ever disturbed the peace. Today the nature reserve is no more, one of the first casualties of the Olympic bulldozers, and just a stone's throw from the tunnel mouth into which Eurostar trains plunge on their seven minute journey from Stratford to St Pancras. Post-2012 parkland proposals for this spot suggest that all may not be lost, although it'll be some years before any artificial landscape regains the unplanned charm of the original. Performers and entertainers required: In 1209 King John opened 'Old' London Bridge. This year will mark its 800th anniversary. To commemorate this and to raise money for The Lord Mayor’s Appeal the London Bridge Anniversary Fair will be held on 11th July. London Bridge will be closed to traffic for the day and the historic bridge will be recreated with craftsmen selling their wares as they would have done hundreds of years ago. What we need: The Appeal has asked us to find performers to entertain the crowds on the bridge during the day. All are welcome – from poets to jugglers to musicians to actors – but should provide entertainment appropriate to the period that the old bridge stood - 1209 to 1831. Not a terribly accurate historical re-enactment, then. A complete mix of eras, bundling together bell-jangling jesters and frock-coated thespians. But how are the organisers going to find sufficient entertainers to fill the bridge? What you do: If you're interested in being involved please send a link to your work using Twitter. It's the easiest and quickest way to collect them. Hang on? You what? The easiest way for performers to apply to take part in this bridgefest is using Twitter? Are you sure? How is this supposed to work? First, log in or register with Twitter. I don't know about you, but I doubt that many Elizabethan jugglers have a Twitter account. I don't see them tweeting away online, sending messages to their friends @HurdyGurdyMan and @WanderingMinstrel. I doubt that the interactive world of social media has yet penetrated the Tudor street entertainment community. But sorry, these are the rules. If you want to juggle piglets on London Bridge in July then you need a Twitter account, no questions asked. Send a post, also known as a 'tweet', to @LondonFestival, including a link to your work. Starting the tweet with @LondonFestival is the easy bit. Potential applicants will probably get rather stuck after that. How on earth do you "link to your work" if you're a medieval stilt walker? Do you need a Facebook page? (Hi, I'm Percy Topple and I'm a medieval stilt walker) Do you need a YouTube video? (Hi, this is me wobbling on stilts at Compton Bassett Village Fete) Do you need your own website? (Welcome to medievalstiltwalker.com) This isn't sounding straightforward, not in any way. The tweet will be seen to the right of this page soon after and it will include your link. We'll take a look at them and put selected links in an Anniverary Fair mosaic below including a photo. Due to space restrictions we can't promise to include them all. Please note this does not mean you have been selected to perform. It's only to help us decide who would best fit the theme of the day. This appears to be a very public audition process. You put yourself up for selection using Twitter. The fair's organisers might or might not think you worthy of inclusion in their mosaic. And then they might or might not want to hire you on the day. And everybody reading the webpage will be able to discover the precise point at which the organisers lost interest. It's like they're doing you a favour, rather than the other way round. You can also use various other services to send us the picture. For example, twicpic.com. There are popular twitter clients that have built-in support for TwitPic. Help, this is all getting a bit complicated, especially for Twitter novices. And the fact that twicpic.com is a spelling mistake may not be particularly helpful either. Whatever happened to simple means of communication? Twitter most definitely isn't the easiest and quickest way to collect the application information the festival organisers need. They'd do better with email, or an online form, or indeed any modern communication medium which functions using more than 140 characters. But instead the organisers appear hellbent on using Twitter to gather friends and followers and publicity, just to appear popular, even though their attempt at community-building is at the complete expense of practicality. Sometimes social media isn't the way to go. Sometimes web 1.0 is best. So if you are a medieval acrobat and you fancy a day being historically brilliant on London Bridge, why not just email Greg and be done with it? And see you there? In September 1938 the famous psychoanalyst Sigmund Freud fled his home in Austria in an attempt to escape from Nazi persecution. He was 82 years old, with terminal cancer, and longed to live out his final months in a place of safety alongside his beloved family. So he came to England and moved into a large townhouse in West Hampstead, in a leafy suburban avenue just up the hill from Finchley Road station. A year later Freud was dead, but his final home still bears the mark of one of the greatest minds that ever lived. Freud's house looks particularly alluring in the spring, behind a clipped green hedge beneath blossoming branches. Step through the pale blue front door into the entrance hall and it's equally peaceful inside. The house is very much as it once was, with Sigmund's possessions and collections on display from room to room. The ground floor study reflects many aspects of his personality. At the garden end is Freud's desk, stacked with intricate statuettes from around the world. His specially-made chair, designed for slouching, looks like an abstract torso with open arms (very Freudian). Around the walls are leather-bound volumes interspersed with a number of classical antiquities - this was more Freud's museum than his library. And up against the far wall, yes it is, it's that couch. It was donated by a grateful patient in 1890 and was the centre of Sigmund's greatest work over the subsequent half century. Here his clients reclined to outpour their dreams, while the old man sat in a green tub chair to one side trying to make sense of their free association. The couch is still covered by a beautiful oriental throw, its border illustrated with (what else?!) a row of fertility symbols. Freud saw only a handful of patients during his time in London, so it seems somehow highly unfair that this historic piece of furniture has ended up here rather than at his former residence in Vienna. Freud was so frail during his year in Hampstead that he never once went upstairs. He never saw the light spacious bedrooms, one now devoted to an exhibition of his life and work, another now somewhere to sit and watch documentaries and home movie footage. 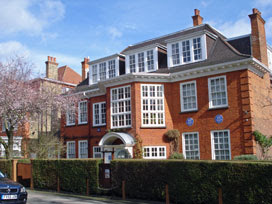 An adjacent drawing room is devoted to his daughter Anna, herself a psychoanalyst of note, whose blue plaque graces the front of the house along with her father's. Meanwhile on the landing are further objects, relics and treasures collected over a lifetime of cultural travelling, plus artwork including a Dali portrait and a dreamlike painting by the Wolfman, one of Freud's most famous patients. The back garden was the great man's pride and joy. He'd never had one before, nothing so green and leafy, so spent much of his final spring and summer sat out in the open conservatory. That conservatory is now a shop where you can buy a mass of Freud-related memorabilia, and I was impressed by the range and untackiness of what was available. A huge selection of books, for a start, some scholarly and others rather more populist. You can buy a SuperEgo badge for your rucksack, or a beardy finger puppet, or even a pair of rather witty Freudian slippers. It's also the place to hire an audio guide on your way in - two pounds well spent to provide much illuminating background information during your walk round the house. With a bit of luck you'll learn a lot about the man who invented psychoanalysis, and learn just a little bit more about yourself along the way. » Erith Museum: It's gone. The old Erith Library finally closed down two weeks ago - by complete coincidence on the same day that I posted about its doomed museum. Thanks to Roger for spotting Bexley council's news release. Erith residents will instead be getting a shiny new library (in a block of flats nearer to the town centre) which opens at the end of the week. It'll have wi-fi access, a dedicated area for teenagers, a Council contact point... and of course some books. But the old museum (and its devoted band of volunteers) won't be following. A few Erith-related exhibits will be rehoused in a few display cases, which is something, but the majority of the collection is going into storage. The council promise that a new home will be found, but there's no indication as yet of when and where. They also promise that the future of the Grade II listed Carnegie library "will continue to be considered as part of the wider regeneration of the Erith Western Gateway". That sounds like "flats" to me. But we'll see. » Only in London: How interesting to see that Visit London amended their Only in London webpage yesterday from "the top 100" to just a "list of 100" (see my update at the bottom of the post below). Coincidence I'm sure. I'm now sorely tempted to test out their list this weekend by picking a random number from 1 to 100, then attempting to visit the "Only in London" attraction suggested. But I'm not convinced that 1, 2, 5, 9, 16, 27, 39, 43, 47, 49, 50, 55, 56, 72, 88, 92 or 99 are possible at short notice. And I live in fear of picking 82. » 5pm update: The Guardian has now responded to the "Only in London" list. How very kind of them to ask me to contribute. » Newsagent: Last month my place of work relocated, which meant bidding farewell to my favourite central London newsagent. Would I find another suitably friendly retail outlet to sell me my weekly Time Out and Radio Times hot off the press, or would I have to commute home on Tuesdays with nothing to read but a wafer-lite freesheet? Turns out I needn't have worried. New location, new newsagent. The minute she called me "sweetheart" after I paid her with the exact money, I knew I'd found my perfect replacement. She's an independent woman selling newsprint from a big cabin in the street. She engages in brief but cheery conversation about the world, the weather and what the previous customer said to her. And she gives me all the Evening Standard freebies for free without expecting me to buy the Evening Standard in return. Worth every penny, I think. » Photographs: I can tempt 20% of you to click through and look at a photo of geese in Brixton, but I can't tempt even 5% of you to look any of my photos of Winchester. It's noticeable, and perhaps not unexpected, that the minute I exit the Greater London boundary your photographic interest plummets. I'm not complaining, I'm just saying. [album] Royksopp (Junior): Seasoned with mellow fruitfulness. [album] Pet Shop Boys (Yes): Sparky crisp instant pop. [TV] Horne & Corden: Some laughs, but inconsistent. [TV] Stuart Lee's Comedy Vehicle: Funniest when not ranting. [TV] The Apprentice: No doubt addictively underwhelming. » Which decade is Tops for Pops? : You've got until midnight tonight to vote in mike's annual inter-era fivefold musical tournament. For the last time. Best get ranking quick. » London Events Diary: If you're looking for interesting one-off events in London, then the IanVisits Calendar is a more useful resource than Visit London and Time Out put together. Yes it is. And now available as a weekly email every Wednesday (sign up here). "Only in London can you visit the historic Houses of Parliament in the morning, ride the London Eye in the afternoon and see a wonderful West End show before deciding which of the world's cuisines to sample in its many restaurants." Well yes, obviously only in London. One of the attractions is called the London Eye for heaven's sake. It's unlikely to be in Tokyo. 1. See where the Gunpowder Plot was first contrived at Eastbury Manor House in Barking. Who'd have thought Barking was so exciting? How thrilling that such a historic event has its roots in an East London suburb. Alas this fact turns out not to be true. Eastbury's links to conspiracy are mere speculation, based on tenuous family connections, and have no basis in proven fact. So say the Gunpowder Plot Society anyway, and you'd expect them to know. 1 down, 99 to go. Heaven knows why this would be of interest to any overseas visitor. It's not even something that fires the interest of many natives. Plus, as it turns out, visiting the battlefield isn't easy because nobody's certain precisely where it is. The Battlefields Trust confirm that "the exact location of the battlefield is in dispute." Even Barnet Council concur: "The armies of Edward and Warwick met for the last time at Barnet at a place called Gladmore Heath. No one is sure where Gladmore Heath was, as the name has long ceased to be used." 2 down, 98 to go. As for Number 3, I can't imagine many foreign tourists wanting to go to Bexleyheath to explore English domestic residential design, but at least number 3's true. Indeed the overwhelming majority of the remaining 98 are true, although some are questionable, some are baffling, some are desperately underwhelming, and some are just plain desperate. Here are a few particular lowlights from the remainder of the Top 100. Three things which aren't "Only in London"
There are some blatant clunkers in the Top 100, but there are also some world-beating experiences. London's a wonderfully diverse city, and this list manages to showcase some of the very best bits. Alas, it fails to showcase many of them particularly well. But oh yes, definitely... three fabulous things that really are "Only in London"
Any thoughts on the other 82? 6pm update: First thing this morning, the "Only in London" website headed its list with the phrase "Here's a list of the top 100". This was clearly false. But since then the offending phrase has been changed to "Here's our list of 100". And this is undeniably true. So that's a result. 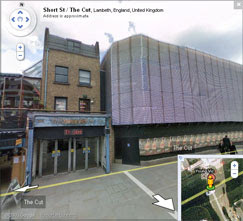 The list's URL has also been changed from .../only-in-london-the-top-100 to .../only-in-london-the-100. So that's a result too. There's also been an edit to number 62, which now talks about the plant collections and not the seed banks at Kew, and so is therefore true. That's a result as well. I still think that the list is a perverse mix of gravitas, irrelevance and bluster, but at least it's no longer incorrectly described. Only in London, eh? Twyford Down is, or rather was, a glorious expanse of unspoilt downland to the southeast of Winchester town centre. A geographical accident then resulted in it becoming the venue for the fiercest environmental protest of recent years. The result of the ensuing battle was Lorries 1 Landscape 0, which is why a six lane motorway now scythes through the heart of this ancient chalkland . The A33 Winchester bypass used to crawl along the Itchen Valley between St Catherine's Hill and Winchester's water meadows. It was a notorious bottleneck, adding up to an hour to millions of journeys annually, and by the 1990s had become the only remaining hiatus in the M3 to Southampton. Transport chiefs decreed that the gap had to be filled, and looked around for an alternative route. The valley was wholly unsuitable for a wider road, and there was insufficient cash for a tunnel, so the least worst option appeared to be to drive a deep cutting right through Twyford Down. Local people and environmental protestors disagreed. They didn't want to see an ancient hilltop destroyed for the benefit of through traffic, and a road protest camp was established on the ridge to try to hinder construction. Many pitched battles were fought between protestors and contractors, but the road lobby eventually won through and the new chunk of motorway opened to traffic in 1994. Ironically, once the exorbitant cost of the policing effort was added in, it turned out that a tunnel would have been cheaper to build after all. Visit the northwestern flank of Twyford Down today and the new road is barely visible. From the footpath along the narrow chalky valley below, for example, the land still appears to rise up to the same windswept ridge as before. But it's all an illusion, as the relentless background noise of not-so-distant traffic bears witness. Clamber up the slope and the land suddenly drops away behind a wire fence to reveal a stark white gash, through which thunder cars and lorries and holiday-bound coaches. They pass through this unseen upland in under a minute, a tedious traffic jam avoided but an ancient landscape destroyed. Around nearby St Catherine's Hill, however, the view is much improved. 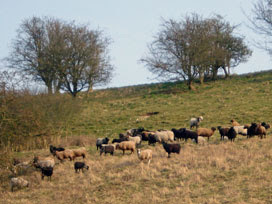 The A33 at the bottom of the hill has been covered over and landscaped to create a long thin grassy meadow, returning to public use a far greater area of chalky downland than the two hectares which were lost. As environmental mitigation goes it's unexpectedly impressive, and has helped to recreate a continuous green heartland along the Itchen valley. Meanwhile wildlife continues to make the best use of what remains up on the Down. Sheep graze the bracken slopes a few feet from the hard shoulder , butterflies flit undisturbed across the heath and green woodpeckers swoop undisturbed from tree to tree. This remains an absolutely glorious spot for a walk... but only if you're deaf. At the southern end of Keats' daily walk, in meadows opposite St Catherine's Hill, stands Britain's oldest charitable institution. 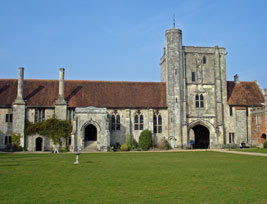 It's the hospital of St Cross, and it's been offering hospitality to travellers and the poor for more than 850 years. St Cross was established by Henry de Blois, a grandson of William the Conqueror, to provide shelter and sustenance for 13 frail and penniless men. Twenty-five Brethren still live in the high-chimneyed almshouses on site , and there are many more deserving cases on the waiting list (alas many won't survive the wait). For a small fee visitors are permitted to queue-jump and look around inside, including access to the Brethren's Hall (a medieval dining room) and the walled Master's Garden (still emerging from wintry sleep). One quaint tradition is that travellers are given a free cup of ale and a morsel of bread upon request at the Porter's Lodge (but only if you ask outright, otherwise you don't get). Even though this was never a religious community, there's still a cathedral-shaped Norman church in one corner of the site . It's much too big for the inmates so it doubles up as the parish church, and the interior's mighty impressive for such a small scale place of worship. The transepts may be a bit of a mess at the moment because there's some urgent re-wiring going on, but that's all part of a campaign to get the place spick and span before the arrival of the hospital's new Master on St George's Day. He's in for a treat - this is a delightful and very peaceful place to retire. Long before London was the nation's capital, the seat of kings lay in deepest Hampshire. 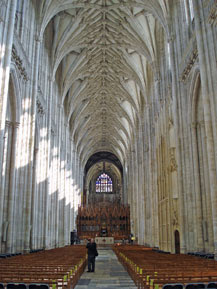 Winchester was established as the capital of Wessex about 1200 years ago, surrendering its superiority to London only following the Norman Conquest. Its most famous ruler was the legendary King Alfred, the only English monarch ever to be officially deemed 'Great'. His statue now stands at the foot of the High Street , conveniently located for the tourist information office, and looking down over a row of Park and Ride bus stops. Winchester's a bit like that, marvellously old but with a twist of new, and it made for a splendid spring day out. Where else to start but the cathedral? It's the longest Gothic cathedral in Europe, 170 metres in length, and a mighty imposing sight visible across the city . There used to be an Old Minster nextdoor, dating all the way back to 648AD, but that's now visible only in outline on the grass. Five quid will get you inside its replacement, and then you can gawp in wonder at the scale and spectacle of medieval architecture. The nave is most impressive , with a high vaulted ceiling above tall Norman arches, and you may either choose to sit here in quite contemplation or whip your camera out and attempt to take arty shots . Jane Austen is buried beneath a plaque in the northern aisle, and the house in which she spent her last days is only a few yards round the corner in College Street . Beyond the low altar is the medieval quire , packed with ornate carvings and (if you pick your time right) angelic voices in cassocks. Look up on top of the screens in front of the high altar and you'll see six painted mortuary chests containing the relics of several Saxon and Danish kings. Canute's up there, and Ethelwulf, and the odd important bishop too. Alas there's no trace of the most famous bishop of all, 9th century St Swithun. His shrine has been plundered, shifted and destroyed over the years, but you can still see the tiny arch through which pilgrims used to crawl to pay their respects . The glazed floor tiles here are some of the oldest surviving in the country, and it's a joy to step across their delicately crafted heraldic and geometric patterns . Take the stairs in the south transept and you can climb up to view the Winchester Bible, an exquisite document inked by generations of monks with perfect handwriting, and illustrated by vivid gold-leaf drawings. As the building's creators once hoped, this space is still heavenly.  Great Hall: Only the 13th century Great Hall survived Cromwell's demolition of Winchester Castle. 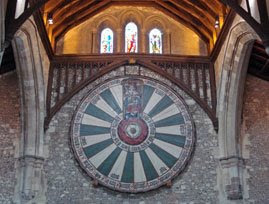 The beam-roofed building's impressive enough, but completely upstaged by the Round Table hanging on the west wall . It's not the genuine Round Table of legend, alas, just an 18-foot oak reconstruction ordered by one of the Plantagenet King Edwards. And that's not Arthur in the centre, that's King Henry VIII who had the table repainted to impress a visiting European monarch.  City Mill: Recently restored by the National Trust, this 18th century watermill squats over the River Itchen at the foot of the High Street . There are some beams and wheels and ropes to gawp at, and maybe some otters too if you time your visit right. The best bit, almost but not quite worth the £3.50 entrance fee, is the opportunity to stand in a confined space downstairs and watch the river thundering through the millrace.  Buttercross: A many-pinnacled monument halfway down the High Street, once the centrepiece of medieval market trading, and now just somewhere to sit and nibble something unhealthy from one of the two neighbouring pasty shops .  St Giles' Hill: The perfect city viewpoint , just a short climb beyond the Itchen, whose grassy slopes are promoted as the best place in town to watch the sunset.  City Museum: This town has 2000 years of history, so there's a lot to cram in. Top floor Roman (with some impressively large chunks of tiled mosaic), middle floor Alfred's kingdom (and a canter through the subsequent millennium), and on the ground floor Winchester's more recent tourist and commercial heritage (including an evocative recreation of a 1960s corner shop).  Westgate: Another museum, this time accessed by climbing up to rooms above the old city gate. It's not a thriller (ooh look, a complete set of Winchester's historic weights and measures), but the view from the roof almost makes up for it .  Military Museums: If you're the type who loves pottering around museums depicting army life, Winchester has a cluster of six. There's one devoted to the Gurkhas, another to the horseback Hussars, another for the Royal Greenjackets, etc. They're all housed in the former Peninsula Barracks, built on the site of Winchester Castle. Me, I gave them a miss and enjoyed the central formal gardens instead . OK, I've done the cathedral, because you have to do the cathedral. I was too late for the tower tour, and the crypt's closed due to flooding, but the rest of the interior (especially the nave) is magnificent. Gothic spiky bits, geometric roof bosses, and a beautiful medieval bible hand-scribed by monks. And now I'm sitting on the cathedral green, surrounded by gossipy teens and sunbathing cyclists and wine-drinking mummies feeding gurgling babies. Lots more to see, apparently, but it's ever so tempting to stay right here. Three stops later, and I'm striding down the hill into the historic city centre. The main library, recently remodelled in shiny glass, has a name almost as pretentious as my local Idea Store. The main shopping street has a half-timbered Boots the chemist and a pizza restaurant in a mill cottage, all watched over by a legendary statue. I've bypassed the main tourist spots to hike uphill for a panoramic view over the rooftops. I'm sharing the view with two bouncy kids jumping on the nextdoor bench, and three empty cans of Fosters. Now to get back down and explore more carefully. Sometimes TfL's maps get better. It seems only fair to point this out when it occurs. I refer to the Flash map on the TfL Live Travel News webpage, the map which shows which London Underground lines are currently disrupted (if any). It's got better. It now displays information more usefully than used to be the case. And this is a very good thing. The Flash map still has a list of Underground lines down the left hand side, along with their current status. It might be 'Good service' if all is well. It might be 'Minor delays' or 'Severe delays', depending on how bad things are. Or it might be 'Part suspended' or 'Line suspended' if trains aren't running between some or all stations. And then this information is visualised, as appropriate, by colouring in the line on the map to show travellers where they might face travel problems. The change on the map relates to 'Minor delays'. Previously, if a line had minor delays it was coloured in. If there were, for example, minor delays on the District line due to a signal failure at Embankment, the entire District line would be coloured green. No matter that the delays might only add a few extra minutes to your journey, in certain places, in one direction - the map would still have shown the entire line as disrupted. If part of the line were suspended while the rest of the line had minor delays, it was impossible to deduce which was which from the shading. All kinds of delays were shaded the same, be they minor, severe or suspended. The map used to show disruption, not possibility, and this often made it less than helpful. The change TfL have made is that 'Minor delays' no longer appear on the map. Severe delays appear, and suspensions appear, but minor delays don't. And that's great. Now, if any part of a line is coloured in, it's worth avoiding. 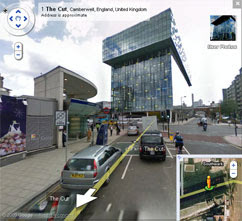 Previously, you wouldn't have known for sure without clicking on the map. So this is a really practical change. There's also a new message on the map when services are running fairly well, which reads "There are no major disruptions currently reported on the tube". This too is a welcome step forward, reducing unnecessary complexity on the map. Hurrah. But there is still one problem, and that's the checkbox label above the map. It still reads "Show undisrupted lines and stations in grey", exactly the same as it did previously. Alas this is now less true than before. Only lines with severe delays and above now appear in colour on the map. Just because a line's grey doesn't mean it's undisrupted, it might have minor delays. This may only be a wording problem, but the wording is unhelpful and untrue. There's also the same old problem with DLR and Overground lines. They always appear in grey, even if they're delayed or suspended, because they're not tube lines. Their disruptions aren't allowed to appear on the 'Underground' map, but appear instead (in text form) on their own separate tab. This is not in any way helpful. It might therefore make sense to remove the DLR and Overground from this Flash tube map, because they're not tube lines, but nobody dares. Or it might make sense to amalgamate the DLR and Overground information with the tube map and show all the disruptions in one place, because that would be more useful. Alas TfL apartheid means we haven't quite reached that level of joined up thinking yet. But a TfL map has improved, and this is something to smile about. I shall cheer again if it ever improves further. When I was little, even when I was quite a lot bigger, nobody ever tried to steal my photos. The only people who ever saw them were me and my family and that nice lady at the chemists who sent them off to the developers. I kept them in an album on a shelf in a cupboard, and no website owner ever spotted them. Things are different today. I now keep my photos in an album on a website. I have more than 2500 photos on Flickr, which means that anybody can look at them, which is nice because it's good to share. But it also means that anybody can nick them, which was never the case with good old printed rectangles. » Attribution. You must give the original author credit. » Non-Commercial. You may not use this work for commercial purposes. » No Derivative Works. You may not alter, transform, or build upon this work.  For any reuse or distribution, you must make clear to others the licence terms of this work.  Any of these conditions can be waived if you get permission from the copyright holder. The well-known builders equipment company have been running an online competition to find "The Building Britain is Most Proud Of." The public nominated a shortlist, and that shortlist was then illustrated using photos stolen from Flickr. They nicked my photo of the Hoover Building, and they nicked Rick's photo of Leeds Town Hall and they nicked Dave's photo of Bletchley Park. They used 30 photos altogether, all without asking, which is quite appalling really. The competition looks to have been a biased washout, with 19 of the buildings gaining no votes whatsoever, and it closed last Friday so it's no longer possible to see what the fuss was all about. But it's nothing to be proud of. Shame on you, Wickes. Last year Walk London, the body which promotes London's strategic walks, published a set of five regional guides. They're glossy and attractive, designed to tempt you into trying a selection of waymarked strolls (although absolutely no use whatsoever if you fancy following the walk on the ground). And ooh look, there are two of my photos in the North East booklet. Rather worryingly I completely failed to notice this until somebody pointed them out yesterday, despite the fact that I've owned a copy of this leaflet for months and both photos have the caption "© Diamond Geezer" slapped over them. Walk London never asked for permission from me up front, but I think the terms of the licence are met. Sort of. The BBC will soon be revamping their revision website for GCSE students, and obviously the geography section would be incomplete with a picture of a meandering river. This shot from the Sussex coast is one of my favourite photos, and I'm well chuffed that half the nation's 16 year olds will be using it to further their fluvial understanding. The BBC played this one perfectly by the book, requesting written confirmation that I was happy with them using it on the Bitesize website. Well done BBC. When a nasty road accident occurs on the North Circular and you have no photographer in the area, what do you do? If you're the Daily Mail you nick my IKEA photo and use it on your newspaper website, that's what. I complained by telephone when a reader pointed out this transgression, and the Mail instantly apologised (because they know they're not supposed to do this sort of thing) and removed the picture. But perhaps I should have demanded appropriate financial settlement from them, just to make a point. TICK Islington Tunnel: The Islington Liberal Democrats wanted an Islington photo for the header on their website, so they asked me nicely for use of my canal photo, so I said yes. Presumably no politician in Islington has a camera. CROSS? Olympic Stadium: Jonathan uploaded my latest stadium photo to Twitpic so that he could add a funny caption. He's attributed it to me, sort of, but this still feels rather naughty.